This article explains why it is a good idea to purchase an elevated pet feeder. It also includes a list of characteristics of a good elevated feeder to help you make a smart purchase. Why is an Elevated Pet Feeder a Good Idea? Larger canines such as German Shepherds, Irish Wolfhounds and Old English Sheepdogs can benefit from using elevated dog feeders. This is because these kinds of feeders help dogs more easily eat their meals. With an elevated feeder a large dog won’t have to bend over to lap up water and food. This reduces the amount of water splashed around when drinking. For an older dog, an elevated feeder is a good idea. Many older dogs aren’t flexible and some have weak neck muscles. 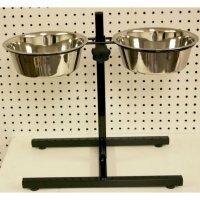 By raising the bowls up off the floor, your older dog will have a much easier time eating and drinking. If your dog is sick or weak due to surgery, an elevated pet feeder is a smart purchase. For the reasons mentioned above, an elevated dog feeder will make feeding much easier for your weak and weary dog. By the way, there are elevated cat feeders too. All of the same good reasons apply. Below are several characteristics to consider when buying an elevated dog feeder. Some of the characteristics are more important than others, and your situation and your pet will dictate what is “must have” or not. Bigger is (Usually) Better Since your looking for an elevated pet feeder, it probably means you’re feeding a big dog. That means you’ll want a large sized pet feeder. If you opt to save on money buy purchasing a small pet feeder, you could end up very disappointed. Your dog will be frustrated too. Bigger feeders are necessary also if you have multiple animals using the same dishes; some bigger feeders have multiple dishes and bowls. The disadvantage of a larger feeder is finding a good place to put it in your home, since it will be bigger and bulkier than a normal pet feeder. Easy to Clean Having a dog is a joy because they are playful and dependable creatures. The downside is cleaning up after them. No matter how well-trained your dog is, you’ll always be the one to clean his pet feeder. If you’ll buy a pet feeder that is difficult to clean, that’s going to be your problem, not your dog’s. Stability (Very Stable Base) Dogs, even well-trained ones, accidentally tip their feeding bowls once in a while. When this happens the food has to be cleaned up, which is a hassle for you. If you’re not around, you pet will be hungry which can lead to poor behavior. Training can help this, but a hungry dog is usually a bad dog. The bottom line is to make sure that the elevated pet feeder you’re going to buy has a stable base. Height Adjustment You might want to consider adjustable height pet feeders. These can be tricky to find but they can be a wise investment. If you expect your puppy to grow to a large size, you can buy a feeder that will grow along with him. Heated Some dogs love when their food is heated and seemingly fresh from the stove. Heated pet feeders are also ideal when you and your pet dog live in cold climates. If the elevated pet feeder is outside, this can be a great idea. It can keep the water from freezing over. No one can drink ice after all. Automated Dispensing Having an automated elevated pet feeder is good if you leave your pet alone in the house for long periods of time. The pet feeder should be able to consistently dish out the exact amount of food or pellets you wish it to dispense. This is important for dogs with medical conditions like diabetes as this requires precise feeding. The automated elevated pet feeder should also be able to dispense both small and large types of pellets. A timer will ensure that your pet will be happily fed several times a day, especially when you’ll be out overnight. Protection Against Pests and Food Theft Some pet feeders are cleverly designed so that critters can’t get inside the pet feeder and steal or contaminate food. At the same time, your dog will be able to figure out how to get to the food, or you can easily provide access when your pet is outside. If the feeder is outside, this can be important, especially if you have to deal with squirrels and deer.